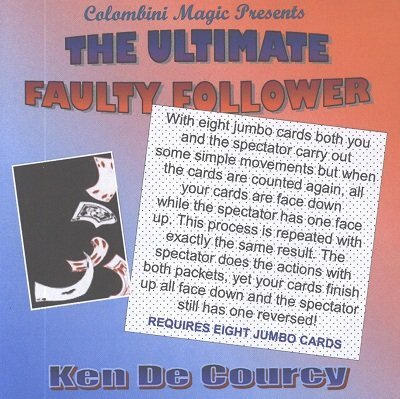 An effect by Ken de Courcy. Performed by Aldo Colombini. A terrific three-phase routine with jumbo cards. Having enticed a spectator up to help, you hand him eight jumbo cards and say, "Please give me any four and keep four yourself." This done, both you and the spectator carry out some simple movements but when the cards are counted again, all your cards are face down while the spectator has one face up. This process is repeated with exactly the same result. There is obviously only one answer; the spectator will have to do the actions with both packets. He does so, yet your cards finish up all face down and the spectator still has one reversed! What makes the routine so strong is the fact that jumbo cards are apparently too large to manipulate, the sequence is worked on the classic 'three' formula and the method used each time is different.